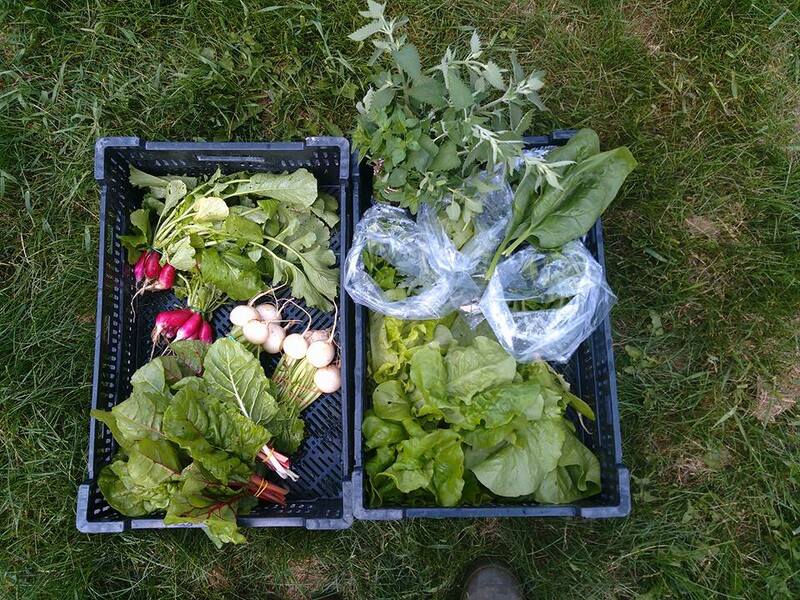 Large Share pictured: 2 summer squash, 2 cucumbers, 2 bags of Mizzuna/spinach mix, 2 bags of lettuce mix, 2 heads of lettuce, 2 bunches kale, 2 bunches swiss chard, 2 bunches radishes, 2 bunches herbs. New this week are the first of our cucumbers! Everyone will get to try the slicer cucumbers from the greenhouse, and by next week we should start seeing lemon cucumbers too! New this week are the first of our summer squash! This year we are trying two varieties called zephyr and dunja. We like to use the large zucchinis for zucchini bread, the large yellow squash for grilling, and the smaller sized squashes sautéed or in spaghetti carbonara. It is getting too hot for our spinach and they are going to seed or failing to germinate, so this will be the last we see until fall. Enjoy this peppery mix by itself or mix with the lettuce mix. Our favorite lettuce mix variety from Johnny Seeds, this is a mix of green oak leaf, red oak leaf, green romaine, red romaine, lollo rossa, and red leaf lettuces that always gets rave reviews from our customers. This week we've also added some mizzuna to it. This week we have more lettuce heads, we have butter crunch, black seeded simpson, or romaine to choose from. Small shares get one head, large shares get 2 heads. Chard is a leafy green vegetable often used in Mediterranean cooking. The leaf stalks are large and are often prepared separately from the leaf blade. The leaf blade can be green or reddish in color, the stalk can be red, white, yellow, orange or pink. Chard has highly nutritious leaves. Fresh young chard like today's are great used raw in salads. Mature chard leaves and stalks are typically cooked or sautéed, their bitterness fading with cooking. Try the swiss chard as a side dish, with this easy Savory Swiss Chard recipe. Our favorite way to enjoy these greens is by tearing the leaves into strips and sauteing them in olive oil and garlic with some salt, pepper, and red pepper flakes. This week we have more radishes to add some heat to your salad. For a change, try them thinly sliced on buttered sourdough toast, you won't regret it! This week we have the first kale of the season, enjoy these young leaves as kale chips or sautéed in olive oil, garlic and a little cayenne, or add them to a soup, or a frittata, or a quiche, you can't go wrong with kale. This week we have greek oregano, italian oregano and catnip. New this week is Mustard greens. Brassica juncea is more pungent than the closely related Brassica oleracea greens (kale, cabbage, collard greens, et cetera), and is frequently mixed with these milder greens in a dish of "mixed greens", which may include wild greens such as dandelion. As with other greens in soul food cooking, mustard greens are generally flavored by being cooked for a long period with ham hocks or other smoked pork products. Mustard greens are high in vitamin A and vitamin K.
We have some more Spinach leaves for everyone this week, fresh from the greenhouse. Farmer Figgins's favorite dish with spinach is sautéed mushroom and spinach sandwich with feta cheese. We've also been enjoying making spinach artichoke dip with the spinach we grew over the winter. This recipe can be done with the amount of spinach a large share receives, for small shares, we recommend halving the recipe. This week we have tarragon, greek oregano, italian oregano and garlic chives. 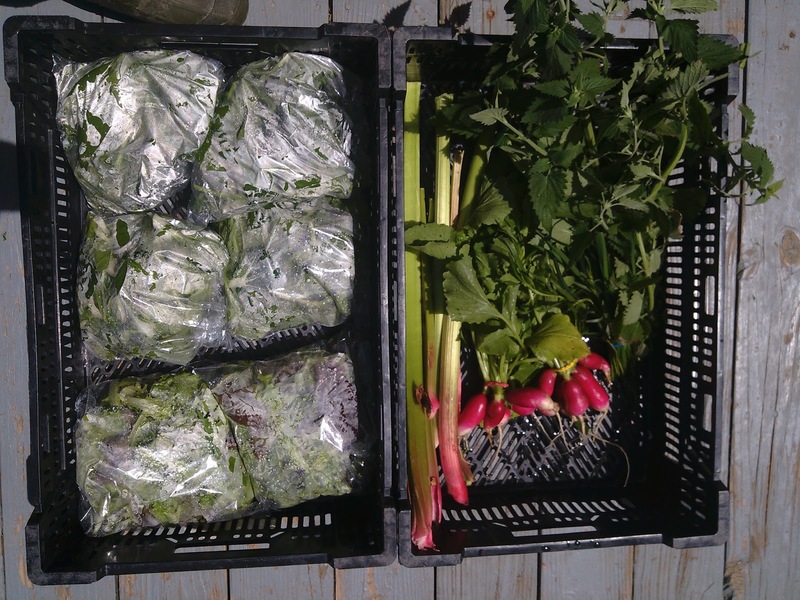 Large Share Pictured: 2 bags of lettuce mix, 2 bags of spinach, 2 bunches kale, 2 bunches swiss chard, 2 lettuce heads, 8 stalks rhubarb, 2 bunches radishes, tarragon, italian oregano and greek oregano. We finally got the long-awaited for rain, buckets and buckets of it over three days. Looks like we have a week of sunshine and summer heat ahead of us though. Hopefully the rain will hold off until this weekend to let our newly cut grass dry for winter hay. In the garden, the weeds are doing well, as are most of the crops, summer squash are starting to just flower, same with the cucumbers and tomatoes in the greenhouse. We have just winter squash, pumpkins and luffa left to plant in the garden, then plenty of weeds to deal with and rocks to haul out. 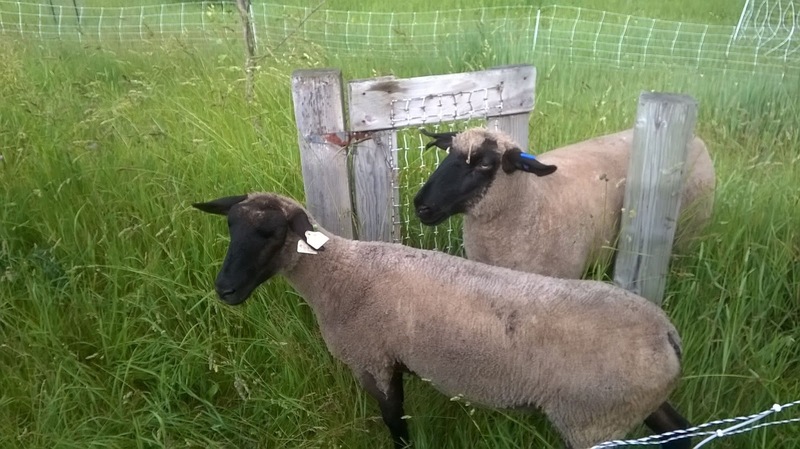 We recently had two new additions to the farm: two Suffolk ewes named Simone and Judy! These will be the breed stock of our future wool/meat flock, we'll be seeing lambs and wool next spring, until then they will earn they keep as water-powered fluffy lawnmowers. This week we have lots of greens for everyone! Spinach, lettuce, kale, swiss chard, and another chance for strawberry rhubarb pie. For the sweetest strawberries around, try the Amish road side farm stand west of Carson City. 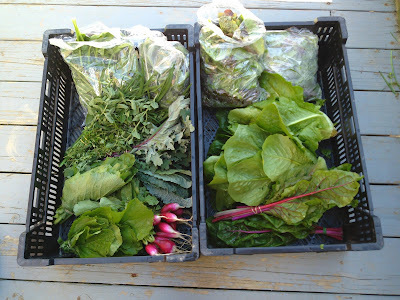 We will have extra lettuce mix (.5 lb for $2.00), spinach (.5 lb for $3), and radish (bunch for $1.50) available at pickup and the roadside stand. This spring favorite can be eaten many different ways. Our favorite is with lots of sugar and baked into a strawberry rhubarb pie! There are also many great muffin and scone recipes which you can use rhubarb in. Others will eat the stocks with some salt raw. If you are feeling really ambitious you can even pickle rhubarb. We have some more beautiful large Spinach leaves for everyone this week, fresh from the greenhouse. Farmer Figgins's favorite dish with spinach is sautéed mushroom and spinach sandwich with feta cheese. We've also been enjoying making spinach artichoke dip with the spinach we grew over the winter. This recipe can be done with the amount of spinach a large share receives, for small shares, we recommend halving the recipe. This week we have tarragon, greek oregano and italian oregano. Last week we had italian oregano, this week we are giving everyone both, try seeing if you can taste the difference! Greek Oregano is usually hotter and spicier. More greens and roots and herbs this week! The greenhouse is bursting and the greens and roots are just starting to be harvestable size out in the field. Unfortunately, we haven't seen rain in over two weeks here at the farm, so that's put a lot of plant growth out in the field on hold. Here's hoping for rain! This week we have the first of our lettuce heads, we have butter crunch, black seeded simpson, or romaine to choose from. Small shares get two heads, large shares get 4 heads. We have a few extra we will be bringing to market, they will be going for $1 per head. This week we have more mixed greens for a spicier salad mix or sandwich addition: Mizzuna, Arugula, mustard and young kale leaves. Perfect raw for your salad, or try them roasted or sautéed or pickled. These Japanese turnips have soft flesh and a mild crisp taste! Or Sautee or Pickle them! This week for herbs we have more catnip, oregano and thyme. Catnip can be given to cats, it contains a feline attractant nepetalactone. Bruise the leaf and let the cat sniff and eat the leaf, the cat will start rubbing on the plant, rolling on the ground, pawing at it, licking it, and eating it. Consuming it results in drooling, sleepiness, anxiety, leaping about and purring, some may growl, some may purr or meow or scratch or bite the hand holding it. The main response lasts from 5-15 minutes. Humans can also use it, drinking a herbal tea. Soak 1/4 cup of fresh leaves in hot water for 5 minutes, then sweeten with honey or sugar. The herb can also be made into a juice, tincture, infusion or poultice. 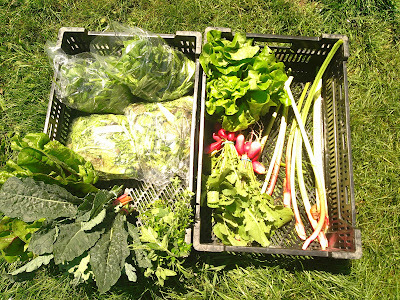 It's our first share of the season and we're glad to see the return of salad greens after a long winter going without! We have our favorite lettuce mix from previous years, also a mix of various greens like arugula, mizzuna, tatsoi, and Swiss Chard. We also have some big spinach leaves from the greenhouse, radishes, rhubarb for something sweet, and herbs like catnip, tarragon, and garlic chives. 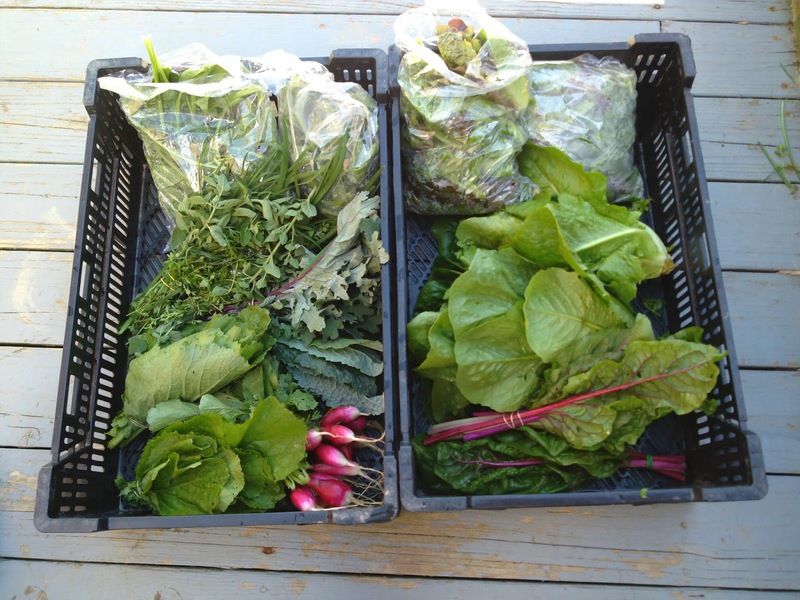 We will have extra lettuce mix and greens mix and eggs available at our farm stand and pickup, see you all there! We have a mix of some of our more unusual greens this year. 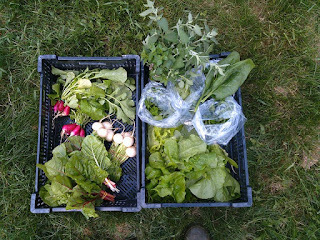 Young Swiss Chard leaves, mizzuna and arugula, both more peppery leaves. We also tried out some tats this year, included in this greens mix, which is a asian variety of greens, a dark green spoon-shaped leaf, often called spinach mustard. We have some beautiful Spinach for everyone this week, fresh from the greenhouse. Farmer Figgins's favorite dish with spinach is sautéed mushroom and spinach sandwich with feta cheese. We've also been enjoying making spinach artichoke dip with the spinach we grew over the winter. This week we have the first of the radishes to add some heat to your salad. For a change, try them thinly sliced on buttered toast, you won't regret it! Our favorite lettuce mix variety from Johnny Seeds, this is a mix of green oak leaf, red oak leaf, green romaine, red romain, lollo rossa, and red leaf lettuces that always gets rave reviews from our customers. This week we have three herbs for everyone, catnip, tarragon, and garlic chives. Catnip can be given to cats, it contains a feline attractant nepetalactone. Bruise the leaf and let the cat sniff and eat the leaf, the cat will start rubbing on the plant, rolling on the ground, pawing at it, licking it, and eating it. Consuming it results in drooling, sleepiness, anxiety, leaping about and purring, some may growl, some may purr or meow or scratch or bite the hand holding it. The main response lasts from 5-15 minutes. Humans can also use it, drinking a herbal tea. Soak 1/4 cup of fresh leaves in hot water for 5 minutes, then sweeten with honey or sugar. The herb can also be made into a juice, tincture, infusion or poultice. Tarragon is used best with chicken, fish or egg dishes. Garlic chives can be used in a similar way to chives, scallions or garlic and are used as a stir fry ingredient, they also do well with egg, shrimp and pork.